At the United Nations this month, Brazil, China, Venezuela and other nations denounced U.S. drone wars as illegal. Click here to add your voice in support of the rule of law. Or — if you’ve already signed — please forward this to friends. 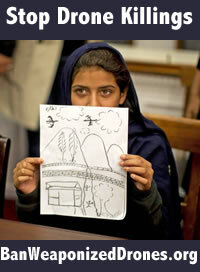 In the countries where the drones strike, popular and elite opinion condemns the entire program as criminal. This is the view of Pakistan’s courts, Yemen’s National Dialogue, Yemen’s Human Rights Ministry and large numbers of well-known figures in Yemen. Popular movements in both Pakistan and Yemen continue to protest against the killing. Wouldn’t we see it the same if the constant buzzing and threat of death were over our heads? Click here to help ban weaponized drones everywhere. If you agree too, please click here. And forward this far and wide. The least we can do is add our voices. Please forward this widely to like-minded friends. 5. Joy First: Who Is the Real Threat to Communities?